Other than that I love everything about the site. Everything is laid out very professionally, both visually and operationally. I very much enjoy the "Feature Box", also the "Side Bar" with the latest posts listed for easy access. The larger choice of smileys is also nice. Oops ... guess I was a little gun hoe. I should have place this in the Suggestion Box ... my applogies in advance ... please move to appropriate secion. It's a pleasure to have you on board kath3. When I'm looking for one of my threads, I just click on my own avatar on the main page. This takes you to your profile, so if you then click on 'find all threads,' you'll be given a list of your threads. another solution is one we've discussed in a previous thread... and that's to create a rant central favorites menu on your browser and just bookmark your favorite threads in there. by doing that, you aren't limited just by your threads but any thread you might want quick access to. @kath3 - I use those links at SuprBay and other MyBB forums I visit as well-- the reason we haven't got them up is simply a matter of space and aesthetics. I was thinking to change a few things around and perhaps add a 'My Content' drop-down menu that would feature the two links you mentioned as well as links to User CP, Change Avatar, Change Signature, etc. Sounds like a great idea to me ... with the drop-down menu you would save space and a cluttered appearance. (04-14-2013, 06:32 AM)Spudgun17 Wrote: When I'm looking for one of my threads, I just click on my own avatar on the main page. 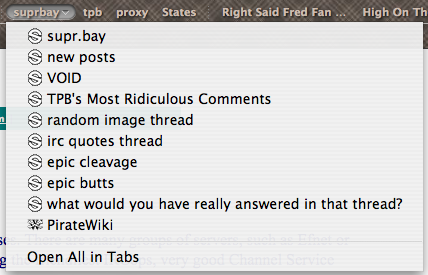 This takes you to your profile, so if you then click on 'find all threads,' you'll be given a list of your threads. I've tried that, and it's good for finding post but not threads. I am not known for quick response time. @Wildcard i love the idea of the drop down idea. Im all for it bc when Im on my phone i get tired of waiting for some pages to load and that feature would help me access certain pages faster. Seriously though ... it's nice and tidy and makes for easier searching.